It is said that Suda 51 always has something to say with his games, even when it looks like he's saying nothing at all. From abstract and disturbed curiosities such as Killer7 to silly and vulgar adventures like No More Heroes, there's always some commentary, satire, or further subtext buried deep within Suda's initially bizarre ideas. Just check out Matt Razak's two-part analysis on the true meaning of No More Heroes 2 for some more proof. Lollipop Chainsaw, with its focus on comedy and balls-out insanity, is perhaps the hardest Grasshopper Manufacture game to scrutinize. On the surface, the game is pure fan service -- a gory zombie hack n' slash game starring a young woman who isn't shy about showing off her physical assets. When you dig deeper you ... don't find much else. However, I think I cracked an underlying theme that runs throughout the story. A subtle one, but one worth examining. Lollipop Chainsaw has something to say on the matter of objectification, and before you think I'm pointing out the obvious -- I am not talking about Juliet. 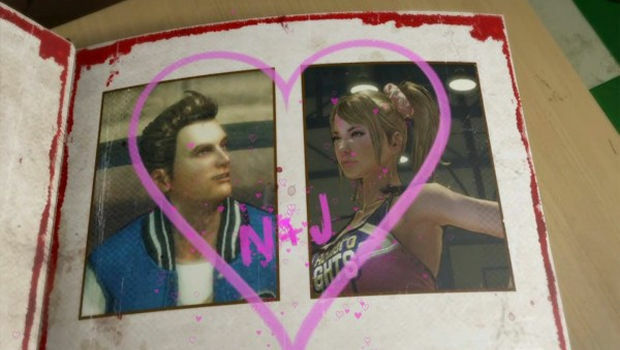 As an eighteen-year-old cheerleader, Lollipop Chainsaw's Juliet Starling seems quite obviously built to fulfill the fantasies of a male audience, and I'm certainly not going to claim that wasn't the intention. She bends over every few minutes to give us a glimpse of what's under her insanely short skirt, and she's not afraid to fight an undead horde wearing nothing but a bikini. I do not think anybody could deny that she, as a character, is objectified in the game. Whether you think it matters or not is up to you, whether you think it's played for genuine sexual satisfaction or sheer comedy is also a fine debating point. It's not the kind of objectification I want to talk about, however. I am actually talking about a character who is literally objectified when he is bitten by a zombie and decapitated by Juliet in an attempt to save his life. The magically resurrected talking head that is the heroine's boyfriend, Nick. From the outset, Nick's plight in Lollipop Chainsaw fascinated me. He spends the majority of the game hanging from Juliet's backside with little more to do than comment on the current situation and helplessly scream in terror whenever his living transportation does something reckless. Nick, as one of a handful of male heroes in the game, is absolutely powerless, rendered unable to perform even the simplest of tasks by himself and existing utterly at the mercy of his girlfriend. When Nick is able to help Juliet out, it is only as a tool. An item. An object. He's tossed around, whipped about, and thrown without much in the way of consideration for his well-being. Even when temporarily crammed onto the headless body of a zombie and given a brief level of control, he's still not in charge. In fact, players don't even get to directly handle the man's movements, instead completing timed button presses to drive him forth while Juliet patronizingly cheers for each struggling, flailing step. Without his body, and completely powerless, Nick is frequently idealized and assessed by female characters who have little to no regard for how their words make him feel. Both of Juliet's sisters talk about the benefits of having a boyfriend with no head -- benefits to them, of course, not the boyfriend -- and review his aesthetic qualities despite Nick making it perfectly clear how uncomfortable he is. Juliet, as Nick's self-appointed guardian and protector, seems totally oblivious to his feelings, frequently telling him how much she loves him even as the wretched creature teeters on the verge of quite understandable despair. The scene that truly made me stop and think about Nick's role in the story was one that involved the entire Starling family, consisting of Juliet, her two sisters, and her father. While the Starlings plan their raid on the next undead target, Juliet's youngest sister, Rosalind, is forcing makeup onto Nick's face. Holding him forcefully in place and delivering a humiliating makeover, neither Rosalind or her sisters are capable of understanding why Nick is upset by his treatment -- treatment made all the more worse when Juliet's father tells Nick off for screwing around and threatens to deal with him if he continues being disruptive. 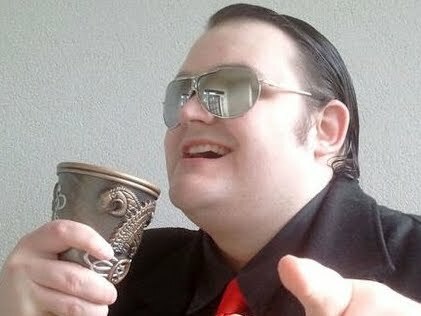 It's all played for laughs, of course, and is quite funny, but when you look at what is happening to Nick, you see him suffering through several issues that commonly affect women, especially in the game industry. Mr. Starling in particular seems to embody a particularly alarming issue in modern culture, made all the more pertinent by the fact that he is a male character -- victim blaming. Blaming the victim is something that people seem to love doing more and more these days, especially when women are concerned. Whether it's guys insinuating that a woman dressed as a "whore" was asking to be raped, or that someone being made uncomfortable by sexual harassment should have "said something" despite the pressure she was under to keep her mouth shut or politely smile, there's a lot of blame being thrown around by society's peanut gallery, and a less than deserved portion of it ever seems to reach the person who started whatever problem occurred. Base objectification, physical and emotional idealization, harassment, all perpetrated by characters who seem totally indifferent to how their behavior might affect the target of their activities. The sheer selfishness of the heroines seems to mirror the attitudes that many men can have towards women, an attitude typified by Juliet when she refuses to kill Nick. At one point, her disembodied boyfriend begs for abandonment (and the inevitable death it would result in), having zero quality of life and feeling like he's lost everything that made him a person. Even as he asks for mercy, Juliet refuses, and gives a reason that sums up the relationship between them perfectly -- "I love you." Her reason for keeping Nick alive in a state that's less than human is because of her feelings and what she wants. It reminds me of certain justifications for problems that have arisen in the gamer community before. It's been said by some that sexual harassment is just a "part of the culture" of online gaming, as if to say that anybody who has a problem with it needs to go away and not express their feelings of discomfort. People hate considering others because of a fear of how it might inconvenience them, and they dehumanize their opposition, render their feelings a moot point, and disregard the potential impact of their own decisions. When a female industry member like Jennifer Hepler is harassed, the scrabbling for excuses and assertions that it was her fault fly in thick and fast. Oh, she started it by saying something we didn't like, she shouldn't have acknowledged the harassment, if she'd just let us continue to insult and degrade her, we would have stopped eventually, so she is to blame. Because of these reminders, Nick's character started to make me feel uncomfortable. I felt uncomfortable because this was a character being blatantly turned into an object, mistreated, harassed, humiliated, and ultimately blamed for his own indignity. It's done to an exaggerated degree, but exaggeration is often needed to shine a glaring spotlight on something. As a result, I started to feel colder toward Juliet as a character because she was, in some scenes, a complete and utter creep. And that, as far as I can assess, is the underlying brilliance of Lollipop Chainsaw. Yes, Juliet is showing her skin constantly and many male gamers will likely ignore all subtext in order to gawp at her arse, but for me, I can't help thinking about Nick's plight, and how it reflects upon real girls in real high schools and beyond into adulthood. By turning the tables, and by placing a male figure into those situations, it goes some way toward making a character that's easier for men to identify with. The outright emasculation of Nick is certainly terrifying enough for a person who shares his gender, and opens the door to sympathizing with the rest of the trials he faces. Who knows? Maybe three or four gamers out there will then make the logical conclusion that, hey, women are kind of treated this way already, without having their heads cut off. Perhaps my interpretation is wrong, but it's the interpretation I choose to have. Lollipop Chainsaw is about objectification, but the base sexual gratification that initially greets the player upon Juliet's introduction is something of a subterfuge. It might still exist for little more than gratification, I should restate, but it's not, to me, the message of the story. The message I have decided to take away from Lollipop Chainsaw is that objectification without regard for a person's feelings can be disturbing, that ignoring someone's protests because you're doing what makes you feel good is alarming, and that sometimes, it takes reversing the roles in order to get some of us to see that. So, treat women with respect, because one day you might be a disembodied head hanging from a miniskirt, and then you'll have to see what it feels like to be somebody else's toy.